“Mayflies” is included in my chapbook, From Every Moment a Second, forthcoming from Finishing Line Press. FLP is taking prepublication orders here. It was also the inspiration for the artwork gracing the cover. I am in debt to Stephanie L. Harper for providing such a vivid and appropriate piece of art for the book. Please note: prepublication sales determine the print run, which means this stage is crucial in terms of how many copies will be printed and the number of copies I’ll receive as payment. So if you feel inclined to help, and are able, please purchase your copy before August 11. Thank you! This entry was posted in From Every Moment a Second, Poetry and tagged Asian-American, chapbook, creative writing, culture, life, mindfulness, philosophy, poems, poetry, writing by robert okaji. Bookmark the permalink. 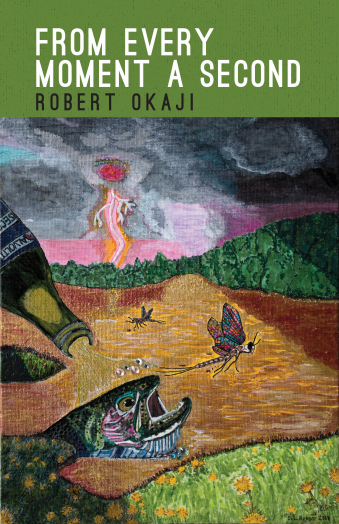 Hear the words that inspired this artwork for the cover of Robert Okaji’s new chapbook, *From Every Moment A Second* in the voice of the man himself! ACK! I had temporary technical difficulties… Reblogged now! I seem to have those quite often! You are choosing wisely which poems you record–the ones that are accessible on first hearing. The recordings are superb. The first literature ever made by people was orally composed and delivered poetry, and poetry that strays too far from this tradition loses something important. Really happy to see that you are making these recordings. They are a great delight. Thanks, Bob. These days, I write to the sound. If a poem doesn’t sound right, it isn’t right. And thank you for the encouragement. Just ordered your book. Can’t wait to get my copy! Pingback: Recording of My Poem “Mayflies” | World4Justice : NOW! Lobby Forum.